DIN 41612 is a DIN standard for electrical connectors that are widely used in rack based electrical systems. The most common application of DIN 41612 connectors is in the VMEbus system. They are also used by NuBus. The standard has subsequently been upgraded to international standards IEC 60603-2 and EN 60603-2. 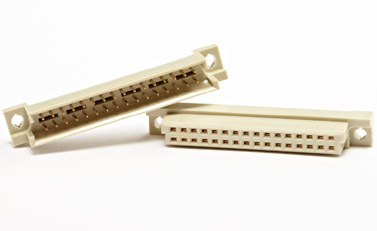 Rego's DIN 41612 Backplane Connectors consist of a series of male and female connectors which include C, R, B, Q, C/2, R/2, B/2, Q/2, H15, F, H7/F24, H11 and M types. These diverse types allow engineers to easily select a pair of connectors to fit the design requirement. Please contact us for further information directly.